African migrants fleeing to Europe risk slave traffickers, starvation and shipwreck. Now, a growing number of those who complete the arduous journey are being turned away, and the Libyan government is detaining thousands in migrant camps characterized by inhumane conditions. Special correspondent Christopher Livesay and videographer Alessandro Pavone received rare access for this exclusive report. Let us first warn that the story you're about to see contains images that may upset some viewers, especially children. Violence has re-erupted in Libya. The U.N.-backed government there has declared a state of emergency after fighting between rival militias killed more than 100 people in the capital, Tripoli. The situation is particularly dire for migrants. Libya is the major gateway for Africans en route to Europe. An estimated 700,000 are now caught in the Libyan crossfire. The fragile government in Tripoli has prevented foreign reporters from entering the country for months. 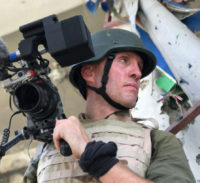 But "NewsHour" special correspondent Christopher Livesay and videographer Alessandro Pavone were granted rare access and, with the support of the Pulitzer Center, filed this exclusive report. Rare sights for American journalists to film in Libya these days, but we're the first U.S. TV crew to enter the country since last year to report on Libya's migrant crisis, a heaving calamity in an unstable land. We're under constant observation by government minders, their suspicions shadowing us everywhere. They don't want to seeing this, the thousands of migrants and refugees from throughout Africa and beyond who use Libya as a way station north to Europe. Each time we try filming them at government facilities, Libyan authorities shut us down. Why aren't we allowed to film? We have permit. We have permits. We have permits for weeks. We have had permits for weeks. With a hidden camera, we manage to film inside this airplane hangar, where Ghanaian migrants from West Africa are about to be flown back to their home country. But we're caught. No government official would explain the obstruction on camera. Many migrants hope for a better life, but often they have left war and desperation at home and fallen victim to the unforgiving Mediterranean, to indefinite government detention on land, or fallen prey to traffickers who torture and even sell them for money. And it's because of those traffickers that Libya wouldn't allow American journalists in for nearly a year after CNN showed African migrants being auctioned off at a Libyan slave market last November. Big, strong boys for farmwork, he says — 400. At a clinic in Tripoli, we meet a 19-year-old Somali named Hamud Abdul Elimi. He says he comes to the clinic from his shared apartment every day to get treatment for his mutilated legs and fingers, wounds inflicted by migrant traffickers. His saga began last year in Somalia, more than 4,000 miles from here, he says, after militants from Al-Shabaab, an East African jihadist group, murdered his brother and threatened to kill the rest of his family. I had to flee. My family paid smugglers to take me to Europe. But they held me in Libya and tortured me. Then they sold me to another group of smugglers that demanded more money. When I couldn't pay, they nearly beat me to death. Hamud gave us this video filmed by a fellow migrate. He says it shows his same traffickers torturing a fellow Somali in the same hidden location in the same way they tortured him. They also electrocuted me and abandoned me with gaping wounds on the side of the road. I thought I was going to die. He wants to tell us more, but the government minders are watching and we fear for his safety. Amid this chaos and fear, the international community is trying to help. Federico Soda is the Mediterranean director of the United Nations Migration Agency. It cooperates with the Libyan government to fly willing migrants back to their countries of origin. He says those they help have given up trying to get to Europe, after enduring inhuman conditions inside detention centers. Most of the migrants that we assist, we're actually identifying in the detention centers. We're also getting them out of quite likely abusive conditions, certainly intolerable and very, very difficult. Abusive conditions inside the detention centers? Yes. I mean, it's — there's abuse. There's overcrowding. There's serious sanitation issues in terms of hygiene. I mean, we are talking about detention centers that are sanctioned by the government. Yes, but we're talking about a government also that has a very loose control of the situation in these centers. Loose control because Libya has been in disarray ever since the NATO-backed overthrow of Moammar Gadhafi in 2011. He had ruled the nation for decades and prevented migrants from sailing to Europe. Today, the oil-rich country remains divided. The U.N.-backed government sits in Tripoli, a rival administration rules in the east, and in between, numerous well-armed militias. Recently, violence has re-erupted between rival militias in Tripoli, killing more than 100 people. Soda says traffickers have taken advantage of the power vacuum and more than 1,000 miles of Libyan coastline facing Europe. Once migrants get to the Libyan coast, traffickers send them off to Europe in overcrowded, unsafe boats. More than 70,000 migrants have arrived in Europe so far this year. Most must first cross the Sahara Desert. It's striking just how similar it is to the desert in the American Southwest. Both places are on the front line of an immigration crisis, people coming from the impoverished, politically unstable south trying to make it to the more prosperous north. The difference is that, in the United States, it's the desert that's the final frontier. Here, it's the sea. So far this year, more than 1,700 migrant deaths have been recorded in the Mediterranean. Most do survive, but a growing number are being turned back, as more and more countries, led by Italy's new government, refuse to accept them. Instead, the Libyan coast guard takes the migrants back to Libyan detention centers. Ghassan Salame is the U.N. special envoy to Libya. Let's be frank. Many of these detention centers are overcrowded. Some of them lack the minimum that is required by international humanitarian law in order to deal with migrants or with refugees. And on top of that, some of them, we don't even have access to them. We travel to the western port city of Sabratha, an area notorious for migrant traffickers who crowd their passengers in unsafe boats for Europe. Basim Bashir Al Ghrabi is the local chief of the Department for Combating Illegal Migration. Our task is to rescue migrants at sea and bring them back to safety. You say rescued, but the migrants, they don't want to be rescued, do they? They want to go to Europe. We are here for humanitarian reasons, but we will use all forces necessary to prevent migrants from coming here. You say do anything necessary to prevent migrants from coming here. We have heard reports that there have been cases of abuse of migrants in Libya. Is that the case in Sabratha as well? I respect the migrants' humanity. They are poor, weak people. It's absurd to use force against them. Back in Tripoli, we meet up again with Hamud, the Somali refugee from the clinic, this time in secret. It's Friday, a holy day, offering us a rare moment free from our minders, who have gone to the mosque to pray. We're on our way to a neighborhood called Abu Salim (ph). We have been warned that we have to maintain a very low profile to go there. There was a shoot-out reported this morning. A shoot-out, we're told, between a dominant militia and unwelcome refugees. Hamud meets us on the street and rushes inside the apartment he shares with eight other young Africans. I can't work to pay my rent. My landlord will evict me in three days. I don't know what I'm going to do. I can't cross the sea to Europe like this. I'm trapped. He blames the traffickers who beat him. But they're not alone. He says, when the traffickers left him to die, Libyan authorities refused to take him straight to a hospital. Instead, they put him in a detention center. They kept me there for two days. By then, gangrene spread over my wounds, and the doctor had to amputate my fingers, my left leg and my right foot. I haven't had the courage to tell my mother yet. It would break her heart. But he hasn't lost hope. He is in touch with a cousin in Canada. Hopefully, they can be reunited, he says. Soon after we parted ways, Hamud endured yet more hardship. Libyan police apprehended him for no reason, he says, and beat with the handles of their guns, then stole $200, money his friends had donated to help him out. He took this video after the beating. Libyan police vowed to kill him the next time they saw him, he says. When we asked him why, he said, "Because I'm a migrant, and they know there's nothing I can do about it. This is Libya." The government in Tripoli didn't respond to our request for comment. Meanwhile, thousands continue to attempt the crossing out of Libya, but as Libya's political turmoil endures and Europe tightens its borders, more migrants like Hamud have no choice but to stay. For the "PBS NewsHour," I'm Christopher Livesay in Tripoli.